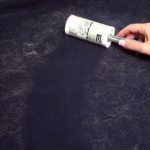 A regular lint roller works just as well on dog and cat hair as it does on your basic daily lint or other microscopic particles. Lint rollers contain an adhesive which picks up those pesky little hairs or pieces of lint off of your clothes or furniture. You can purchase a lint roller at your local Walmart, Target, or pet store. They’re also conveniently available online. Masking tape would serve as a great alternative, since it essentially behaves similarly to a lint roller. The vacuum is just as capable of extracting dog and cat hair, besides crumbs, dirt, etc. If nothing else somehow doesn’t work, then resort to the vacuum. It’s recommended to have one regardless as part of your arsenal of cleaning equipment. Using a damp squeegee on microfiber to loosen up the pet hair makes per hair removal much-much easier. After loosening up the hair you can simply vacuum up the excess pet hair you just worked loose. Brushing your dog and/or cat at least once daily will result in ridding your pet’s coat of loose hair. Additionally, and more importantly, you’ll be maintaining healthy skin and coat for your pet(s). There’s a special brush that can assist you with carrying out this task. Inquire about it at your local pet store. 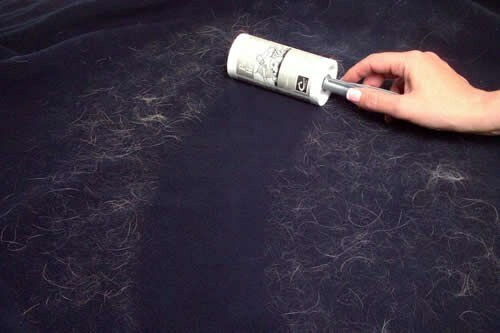 With a lint roller, vacuum, and specialized pet brush at your side, the amount of pet hair roaming around in your house would be reduced tremendously.